I am a very lucky person in that I get to do what I love. I have a passion for animals, especially dogs. I get to work with dogs almost daily. I get to teach people that there is a better, more humane way of training our dogs rather than using force, fear, or pain. I get to make a difference in dogs' lives helping them be an integral part of a family.I love giving a person and their dog an opportunity to make a difference in peoples' lives through pet therapy. I get to help dogs who have behavioral issues overcome these issues and blend into a family rather than being sent to a shelter or rescue. I am most fortunate that I can make a difference in people's lives by offering them the benefits of Animal Assisted Activities and Animal Assisted Interventions. When people are sad or are in a difficult situation, having a dog to pet and interact with makes so much of a difference. I hear so often during or after a vist "this has made my day". I have witnessed the magical power of my dogs transforming a person. I have seen a child who has experienced a profound loss being able to cry, laugh and love on my dog. I have seen a man who has just lost his wife cry on my dog and tell me that he will never forget this experience. I have been with people in a crisis, or disaster, situation and have witnessed the difference the dogs make. All of these experiences motivate me to want to train more teams to provide Animal Assisted Activities and/or Animal Assisted Intervention and Animal Assisted Crisis Response dogs. 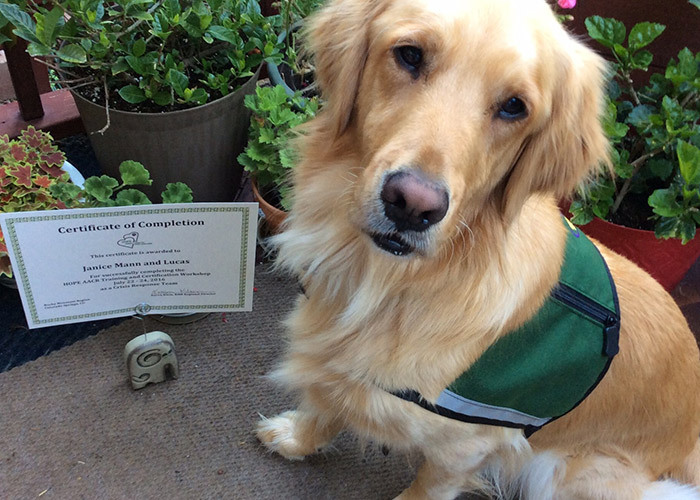 If a dog is not meant to be a therapy dog, then I would like to help that dog be the very best dog he/she can be. I love being able to solve problems and turn an undesirable behavior into a positive behavior. I love attending conferences, workshops, and discussion groups. I read many many books. I watch many DVD's. I am on many email lists which provide daily learning. I love seeing the benefits of body work both for behavioral issues and improvement in mobility. I continue to further my knowledge to offer the most and best that I can. My current path seems to lead me further into the world of Animal Assisted Activities and Animal Assisted Interention. More and more studies are proving the benefits of this type of activity and intervention in many, varied settings. Please don't hesitate to contact me for further information. I love to talk about and share what I do.
" 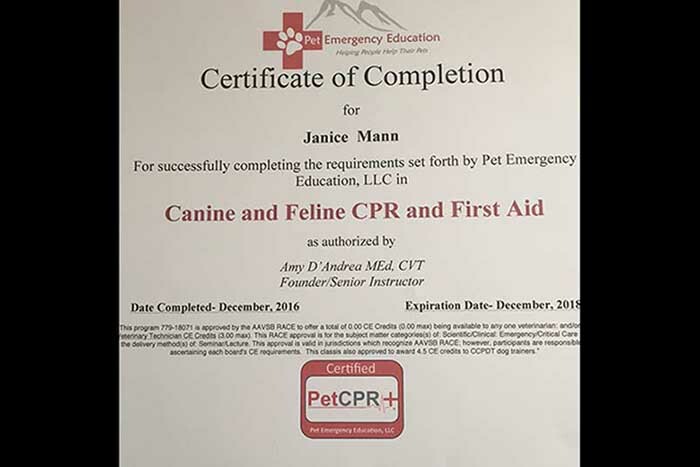 Janice is an extraordinary and passionate dog trainer. 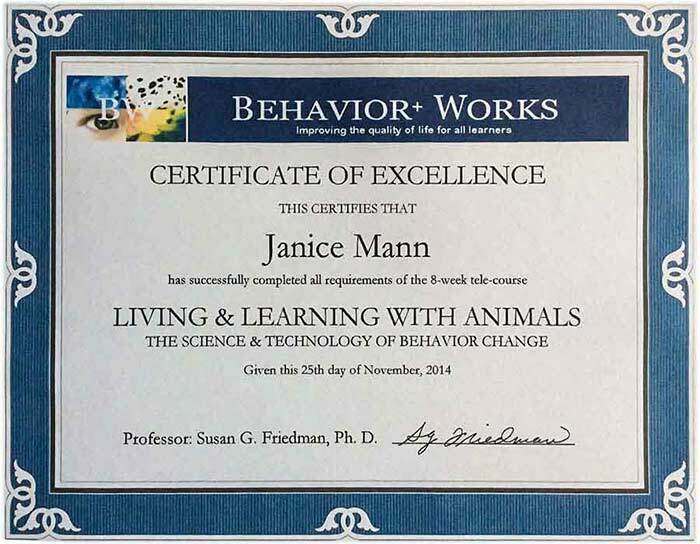 Thanks to Janice, my two dogs and I have learned how to be a great team by using a fun, positive and motivating training process 100% of the time. As a result, my dogs are not only happy dogs, they are well behaved. 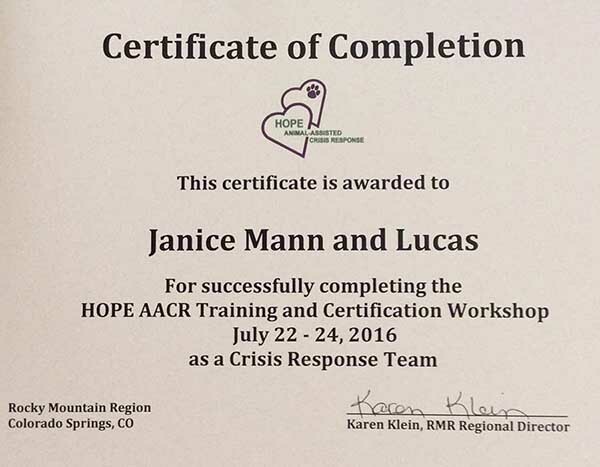 We look forward to our training sessions with Janice, and I won't hesitate to train with her in the future. "